Though Virginia will have chances here and there for national titles, the biggest chance we have is in the relays. Team VA has so many chances for national titles we have to preview them in a more concise form so check out each event below and see who could win from VA.
Nansemond River boys won the indoor 4x2 title and still are thought of as outsiders it seems. That is going to change this weekend if the full lineup is healthy and rolling at 100%. Expect something special from this quartet. Their girls' squad will likely not be at full strength but still is deadly. Them and Western Branch will put on a show come the finals. We are really hoping for this one to be fully loaded on both sides. You have Team War vs Western Branch in the 4x2. War is made for the 4x2 and has really had Branch's number in this event for the last three years. If Branch and War stack this it could very well take a national record to win. 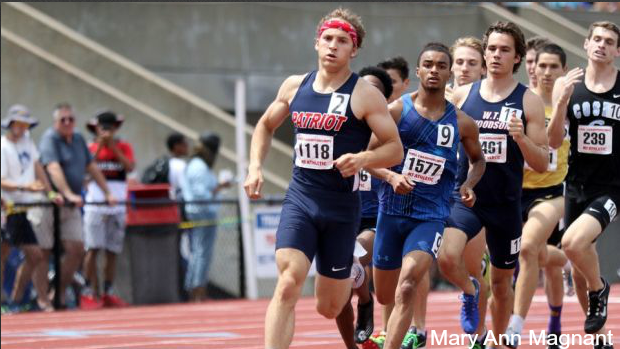 Western Branch has both strong boys and girls team entered but who will run on the relays is the big question. If they fully load the squads they should be on the podium for both but if they do not it will be a tougher race. Highland Springs and L.C. Bird also have very strong lineups on the guys' side while Nansemond River has a decent girls' lineup slated to compete. Bethel is definitely the team to watch on the guys' side with EJ anchoring the Bruins. Their former AAA foes Western Branch could sneak up on them though from the previous section. In the girls' race Western Branch and Team War are entered but the Bullis powerhouse is entered here and could very well set the national record. Since many of the same athletes are entered in different events it wouldn't be surprising to see less "A" runners run here. Western Branch has a very strong girls team entered here and now that Sammy Watson has graduated has a serious shot at winning. The boys' race though has three Virginia teams all in contention thanks to very strong anchor legs. You have Broadway up first with Isaac Alderfer anchoring in the penultimate section. Next up will be Lake Braddock and Patriot with 1:51 splits on the anchor in the fast section. If they can get a decent enough first 800 split then these anchors could bring home a national title. No better way to close out the meet than with the 4x4. You will have Nansemond River (Team War) vs Branch vs Bullis in the girls' race and then the photo finish rematch from 6A states between Western Branch and Colonial Forge. All of these races will come down to stick passes and positioning the final 100m. Western Branch ran away with the 6A state title outdoors and will look to repeat that success at nationals. They rank 17th nationally but are only two seconds off of 4th nationally. Wadsworth (OH) and Green Hope (NC) will be tough competitors in this one but if one of them has an off day it could be a race. Here we have two very strong teams who definitely have the anchors you would want in a DMR. Those two of course are Lake Braddock and Deep Run whose guys' teams are entered in this fast section. They both have 1200 and 1600 legs but the 400 and 800 legs will be the big question marks to make or break their title hopes. They have the legs but they need to hit the splits. West Springfield girls are entered here and with a young squad will look to push the pace and capitalize on having a nice mixture of star power and depth. Even though they are in the "slow section" they will definitely be a force to reckon with in the end based on time. Loudoun Valley is sending their "B+" team for this event which should make things interesting considering their B team finish inside the top six indoors. West Springfield's boys squad will also perform well. Considering this event ends competition Friday means we could see a lot of teams stack this race. Western Branch has a staggering three teams entered in the finals and their "A" squad should be able to roll. Bethel will be their biggest competition in this one and were just one leg away from being able to win it all indoors.